November 16, 2009 March 17, 2013 Eric P. I. 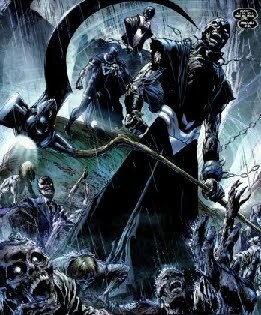 Since everything at DC is currently Blackest Night oriented (isn’t it? ), I wanted to take a look back at what started it all: the Tales of the Green Lantern Corps mini-series from 1981. Being a newish collector at the time this came out, I didn’t know a whole lot of Green Lantern history. 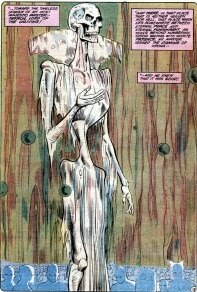 I’m pretty sure I knew about the Guardians and Hal’s connection to them, but I think I learned from this story about the Manhunters and the origin of the Corps. I also was introduced to a ton of Green Lanterns that went on to be staples in the Green Lantern comics, especially Arisia, who is presented here as a wide-eyed teenager and newbie to the Corps. Interestingly, what she says in this series about how she became a Green Lantern doesn’t fit with what was recently presented in Blackest Night: Tales of the Corps, but such is comic book continuity. The series was written by Len Wein and drawn by Joe Staton and Frank McLaughlin, with colors by Anthony Tollin. Issue 1 starts off with Hal meeting Arisia and finding out the entire Corps has been summoned to Oa. They face a grave threat in that Krona has once again returned to destroy the universe, but that’s not all as Krona is but a servant to an ostensibly greater threat that the Guardians, in their infinite wisdom, neglect to inform their Corps about. If I were a Green Lantern, I’d be a little pissed at my bosses for that oversight. The Guardians instruct the Corps to recharge their rings before heading off to fight Krona and his army, but just after, the central power battery explodes, killing several Green Lanterns. The Corps is shaken, but Hal, realizing that precious time is being wasted, rallies the troops. I must have read that first issue a lot, or it was that time before I was introduced to comic book bags and boxes, because I stapled the cover to the book. What’s not to like? 3600 aliens wielding power rings used to fight evil. I couldn’t have asked for anything more at 12 years old. Issue 2’s cover says it all: defeat! The Corps heads out into space looking for Krona (again, you don’t think the Guardians should have had that intel before sending the troops out? Immortal they are, but definitely not strategists.) and one of their number falls: Stell of Grenda who is a robotic Green Lantern. Wait, I thought the Guardians last corps was a race of robots that didn’t turn out so hot. Anyway, much of the middle of the issue is the big fight between the Corps and Krona’s forces. Once the battle is over, however, Hal finds a survivor and begins probing its mind for answers. And then we’re introduced to Nekron! Blah blah blah and the Corps discovers that they must return to Oa because that’s where Krona is going. See, Hal? If you’d hadn’t been in such a hurry, you could have just stayed on Oa and confronted Krona, but no, you had to go off and get more of your comrades killed (but then, I think that would have happened anyway). The Corps engages Krona and is defeated, even after Hal siphons his fellows GLs power in a hail Mary blast that fails (foreshadowing Emerald Twilight, perhaps?). All seems lost (yeah right). The finale introduced to newbie me that there were other Earthmen who were somehow Green Lanterns: Guy Gardner and John Stewart (plus, in issue 1 there was that Charlie dude–they could all get together and form their own Corps), though not active. Meanwhile, the Corps, those bastions of light and hope, seem to have taken to heart Krona’s advice from last issue and are contemplating going home to wait for the end, but Hal will have none of that namby-pamby talk and yells at his fellows: “Meet death on your knees if that’s the way you want it!” Way to throw the gauntlet down, Highball. Much of the rest of this issue is another extended fight scene, but it culminates in Hal taking a leap of faith and invading Nekron’s realm to rekindle the spirits of fallen Green Lanterns trapped their with the creature. They begin attacking their captor, shifting the balance of power (good thing Hal’s hunch worked; would you want to follow this guy into hell?). The Guardians begin repairing the dimensional rift, though Hal is still on the other side still, but an approving Abin Sur appears to gently push Hal through the closing rift and safety. Aww. The universe is safe once more! Back at Oa, the Corps celebrates, and the Guardians, in appreciation of Hal’s determination and recklessness, offer him leadership of the Corps, which he promptly turns down. But his peers do show their appreciation by reciting his oath as they all charge their rings once more. The end. After I read that mini, I wanted to read more Green Lantern (so, good job DC), but the main book wasn’t as good as I recall. Despite that, I think this series made me like Green Lantern a whole lot more and planted the seeds that had me picking up the book from time to time. Again, what’s not to like? A guy can create whatever he wants from this ring he wears, and he gets to have these adventures that are not limited to a terrestrial setting. Good sci-fantasy. Now, I wonder why DC put out this mini-series. Was the main book waining in sales and this was a quick way to drum up interest? Or was it simply a good story that didn’t fit in the main book’s continuity at the time? Regardless, I like how the past is again relevant in the DCU in a big way. I’m looking forward to reading the rest of Blackest Night to see where all this is heading.